Suddenly riots spread in Timur Island of Indonesia, situated on the end of South East Asia and 400 miles away from Australia in 1999. The cause of riots was Christian population of Timur demanding independence from Indonesia. BBC & CNN supported the riots. Due to fear of prolonged lawlessness UNO was forced to interfere at once. The affected East Timur was given into the control of UN peace keeping army. At least Indonesia govt. was unwillingly forced to accept referendum in the affected area on international pressure. As the result of this referendum an independent Christian state “East Timur” appeared on the world map on 20th May 2002. Apparently the process of independence completed in a short period of 3 years. However undercover operations were going on since 1974, when some NGO’s started shifting the Christian from every nook and corner of Indonesia to East Timur, at that time there were only 100 churches. In the 1994 the number of churches was 800. In the whole Asia there was only one Christian country (Philippine) of Roman Catholic sect which increased to 2. Why go far in the history, the appearance of Christian state in the south of Sudan is in front of you. There in spite of Christians having 20% of the total population, through riots the interference by UNO was provided a solid reason. As a result of UN interference the Christians from the whole Sudan moved to south, and at least on 11th January 2011 under a referendum the area rich with the oil and mineral resources have been declared independent. The referendum was held under the supervision of ex-American President Jimmy Carter, ex-Secretary General of UNO Kofi Annan and ex Prime Minister of Tanzania. There happiness over being the part of referendum shows that today’s imperialistic power; USA was behind the disintegration of Sudan. However time will prove that what will be the results of these newly born Christian states like Israel. 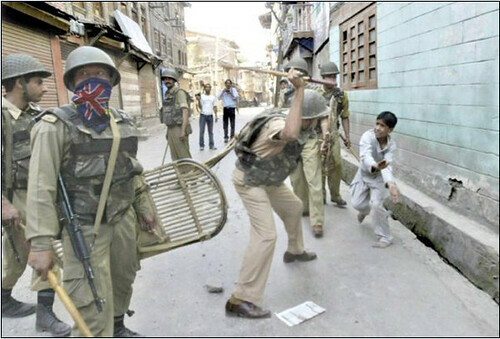 However the question is, “Why west cannot see the freedom movement of Kashmir”? This freedom movement has now started drinking the blood of the 4th generation of innocent Kashmiris. Although western intellectuals may try to falsify it but they cannot reject the truth that British imperialism broke its own formula of division of India, not only created such circumstances so that India can capture Kashmir but also handed over Muslim populated areas of Punjab like Gurdaspur and Pathan Kot. Due to this ignobleness of English millions of Muslims were forced to migrate and at the time of migration the worst massacre was noted in the whole history. The property of Muslims was burnt, Muslim women were mutilated, kidnapped, infants were murdered and afterwards this process of barbarism has been transferred to Indian Held Kashmir and is still going on. If we discuss with the historical references the freedom movement of Kashmiris consists on two centuries. Maharaja Gulab Singh laid the foundation of Dogra Raj after purchasing the Kashmir from British imperialism in 1848 for 7.5 million. As soon as Gulab Singh came to power he banned the slaughter of cow, moreover all Muslims were forced to pay heavy taxes. Masajid were put under watch and Muslims were not allowed to enter into mosques nor were they allowed to hold any religious rituals. The restlessness among Kashmiri people went increasing; Muslims from the other part of sub-continent were not able to help them. At that time the transport was not readily available. However Kashmiri people kept resisting against the Dogra Raj. Although many Kashmiri leaders were put behind the bars but the freedom movement was kept alive. One leader was disappeared by the cruel rulers other took his place. Time went on like this and on 25th June 1931 the freedom movement got a new turn. Under the accuse of creating lawlessness and riots the case of a young Kashmiri leader Abdul Qadir was pending for last 1 year. When ever he was called to the court, Kashmiri people gathered in his support, so the session judge decided to hear the case with in the Jail and the date of 25th was fixed. On the day of hearing the judge have not yet arrived, 50,000 Kashmiri people gathered around the Srinagar Central Jail/prison and demanded open hearing of Abdul Qadir and his freedom. Keeping in mind the protest of people judge did not dare to hear the case in the prison in spite of all the safety measures. During this the time for Duhr prayer (afternoon) came, the agitated Kashmiri were not ready to leave their place. A Kashmiri young man climbed up a wall adjacent to the jail and raised the Adhan, “Allah-o-Akbar”. Dogra police could not bear the daring of a Kashmiri to raise the Adhan, a bang of fire was heard and the Kashmiri young man was martyred. This process went on till the 20 martyrdoms. The 21st Kashmiri in spite of being hit by bullets completed the Adhan and during the excessive bleeding died during the prayer. 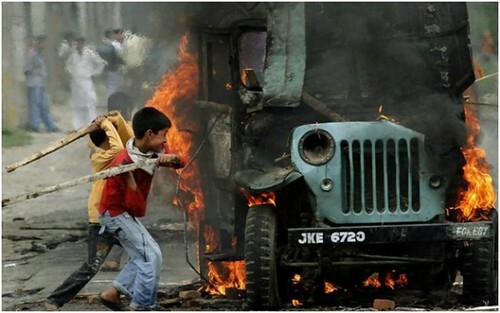 The murder of 21 Kashmiris was a message to the Muslims of India, “See the result of being under control of Hindus”. 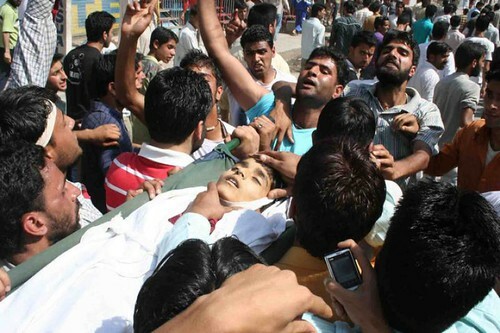 On 25th June when funerals of 21 Kashmiris were held together, whole Kashmir became protestant. The situation was nearly like the today’s situation of Indian Held Kashmir. As soon as the sun rose protests were held, Police used batons and other ways of torture to disperse protestors. Some protestors got injured, some were arrested by police. During this Eid came on. On the morning of 13th July 1931 Kashmiri people gathered in to the Municipal Park, they were astonished to see that Police was already present there. Muslims were stopped from offering Eid Prayers. Agitated protestors started fighting with police. The DIG Ram Chand present there ordered to fire on the unarmed protestors. As a result of this order 13 Kashmiri were murdered. Police did not stop over there but also fired on the persons trying to move injured and dead bodies. The police entered into the Mosques and abused Quran and other holy books there. Today, the above mentioned incidents are parts of history, but the dark night of Kashmir have not ended yet. English proved their enmity to Islam and friendship with Hindus by giving them Kashmir having 95% of Muslim. 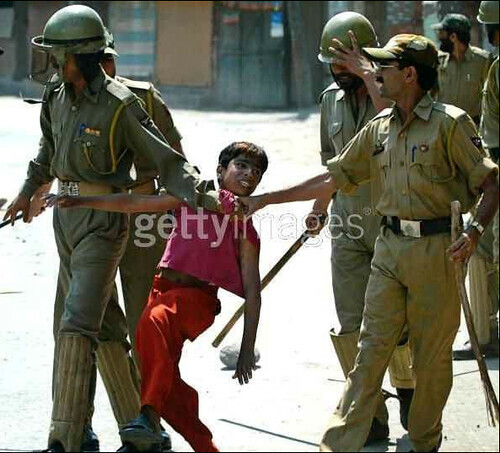 India broke the limits of torture and violations of human rights as soon as it was given control. As state policy Kashmiri are massacred, their women mutilated what types of war crime have not been done in Indian Held Kashmir by state terrorists of India? 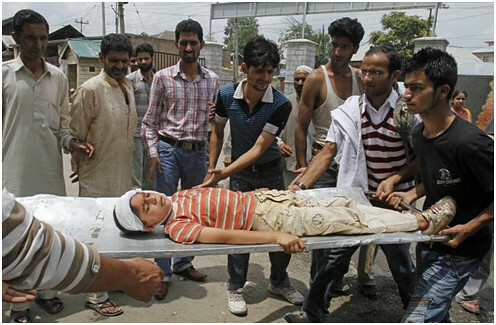 Now this process is going on towards massacre and genocide of underage Kashmiri children. 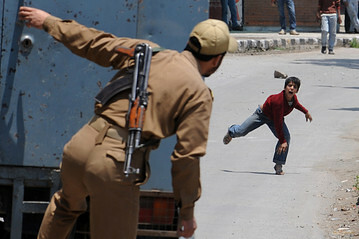 Look at the pictures attached in this article; it is obvious that Indian Army is now at war with underage children. 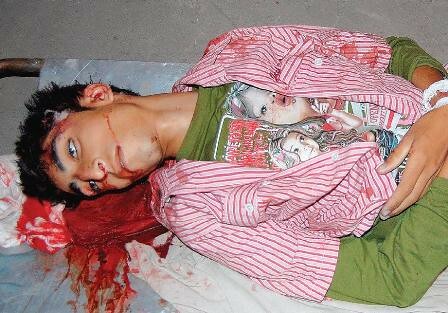 If western media is silent due to their interests linked with India, will this process of murders of underage children in the hands of Indian army will go on forever? Is not this our duty to bring forward the situation of Kashmir and ask world that if Christians of East Timur and South Sudan can be given freedom through referendum then why this right is not for Kashmiri people?